Some photographers believe their strongest work comes from exploring their immediate surroundings. "After photographing California over two decades, I think of myself as a regional photographer, but that does not mean that photography cannot be understood beyond the region. In fact, extensive travel across Europe has solidified my belief that the ancient groves of California native oaks are just as sacred as the holy spaces and cathedrals of Europe." For this reason he makes occasional photographic forays into Poland and Lithuania. "I'm fascinated by the ancient churches of my homeland," he says. "These are holy spaces where millions of people have prayed for hundreds of years. They are places of great humility, and remind us how brief our lives are. I feel the same way when I'm photographing ancient groves of native oaks in California. It is healthy to remember that we are often linked to the natural world in ways we don't even suspect. I am grateful to have the opportunity to experience this through my photography everyday. "I think about how interconnected the world is," Loranc says. "When I'm out on a crisp winter's morning, shooting a stand of native oaks, I see oak galls hanging from the trees. These were once used to make the pyrogallol chemicals I use to develop my negatives. So the oak trees I am photographing played a part in the developer I use to process my negatives of those trees. It is healthy to remember that we are often linked to the natural world in ways we don't even suspect." Roman Loranc is a self-taught photographer who began his journey as an artist in the early 1960s when he received a 35mm camera for his first communication. Over time he learned to print and develop on his own and continues to do so. Roman uses a 4x5 Linhof field camera and shoots the majority of his photographs with a 210mm Nikkor lens, using Kodak's classic Tri-X film, and prints on multigrade fiber paper. Roman shapes the photo from start to finish. The innate drama of the landscapes is reproduced through a variable split-toning (sepia and selenium) technique. The photographer does all the printing, spotting, and archival mounting. To contact Roman directly, please email him at: romanloranc@gmail.com. 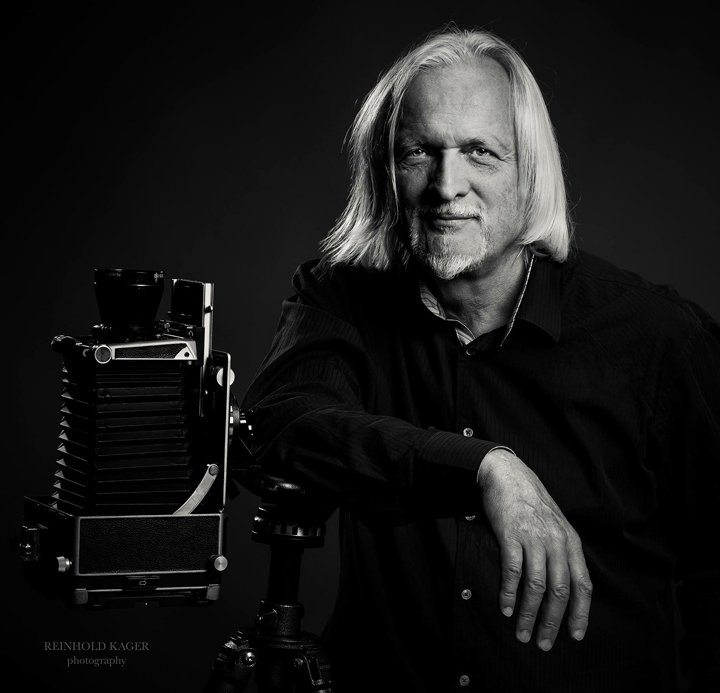 I am a full-time traditional black and white photographer, and practice the methods used by Edward Weston, Ansel Adams, Morley Baer and others in the ƒ-64 school of photography. My subjects include landscape, architecture and occasionally people as they are in their environment. I started photographing when I was 8-years-old, when I was given a small 35mm camera. I was immediately drawn to the magic of photography with that gift. But I wasn’t satisfied with the quality of the images, so I switched to large format. But I could not access large sheets of film, so I made my own glass negatives. I still have these negatives. I soon came to feel a fascination with the chemical photographic process which after exposure to light and immersion in developer, allows grains of silver to form first on the negative, and then again on a final print. It is pure alchemy to me and it is fun. I am inspired by beautiful paintings and my first inspiration as a visual artist came from the paintings of Chelmonski, Stanislawski, Paniewiz and Zaleski. Early on I was also inspired by the work of Jan Bulhak, and Roman Vishniac. Like many -- I photograph with a Linhof 4×5 field camera. A good deal of my work is done with a 210mm Nikkor lens. I only use Kodak Tri-X film, which I stock pile in my freezer because I feel uncertain about my ability to get film in the not-to-distant future. I develop my negatives in pyro using a Jobo processor. I print with Ilford glossy paper, which is archivally washed, all prints are selenium toned to ensure archival quality, and some prints are sepia toned with a special process, then the prints are archivally dry mounted and spotted. Every print is unique, and cannot be replicated 100%; as I print each one painstakingly by hand.